Kappa opioid receptor (KOR) agonists interfere with the reinforcing effects of drugs of abuse. 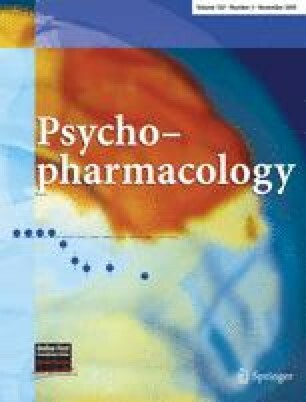 KOR agonists decrease heroin, cocaine, and ethanol self-administration, and block heroin and cocaine conditioned place preference (CPP) in rats. However, KOR agonists also produce emesis and dysphoria, making it difficult to determine if their effects on self-administration are due to an action on reward mechanisms or are secondary to the drug's direct aversive effects. Assuming that endogenous KOR ligands modulate circuits involved in drug and alcohol reward, selective KOR antagonists can be used to clarify these issues. If KOR antagonists increase drug self-administration then it is likely that endogenous KOR agonists directly modulate drug intake. To determine the effects of nor-BNI, the highly selective KOR antagonist, on ethanol consumption and CPP. Thirty-eight male Lewis rats were given free access to ethanol until stable self-administration was achieved. Animals were then administered a single injection of nor-BNI (10 mg kg−1) while ethanol intake was monitored. A single injection of nor-BNI induces a long-lasting increase in ethanol consumption, but does not induce a CPP. A high/low split revealed that this effect was primarily due to an increase in drinking in nor-BNI-treated high drinkers, which drank significantly more than saline-treated high drinkers and also drank significantly more when compared to their own pretreatment baseline. Blocking the KOR system increases ethanol self-administration, suggesting that the decrease in self-administration seen with KOR agonists is due to a direct modulation of reward circuitry. This work was supported by the Wheeler Center for the Neurobiology of Addiction and the Ernest Gallo Clinic and Research Center. The experiments contained herein comply with the current laws of the United States and were conducted in accordance with the Guide for the Care and Use of Laboratory Animals (NIH).